Objectives: This paper was conducted to estimate the mean ideal number of children and to determine the overall prevalence of childlessness, one child, two children and three children and more as the ideal number of children in Iran. It also investigates the effect size of the relationship between social factors and ideal fertility. 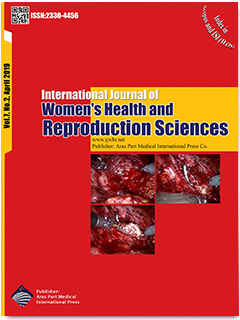 Materials and Methods: A systematic review and Meta-analysis of all published studies (from January1996 until February 2018) on Ideal Fertility . Totally 37 qualified papers and two national surveys were selected with a total sample size of 37,079 women. The degree of correlation between ideal fertility and variables was calculated using Spearman’s correlation, Pearson’s correlation coefficient, and r by using Medcalc 17 software. Results: The mean number of children in Iran is 2.25. The results of Cochran test and I2 statistics showed considerable heterogeneity for the prevalence of ideal number of children (Q=1722.0911, P<0.0001 and I2=97.62%). The proportion of childlessness, one child, two children and three children and more as the ideal number of children were 0.83, 15.99, 56.092, and 22.26, respectively. Pooled correlation coefficients show that variables of age, actual fertility and economic costs of children may be among the most important predictor variables of ideal fertility. Conclusion: Despite differences in actual fertility level in different regions of Iran, the predominant pattern in the number of desired children is two children. This result implies a convergence in fertility ideal; in Iran. If desirable conditions for childbearing are provided, fertility will be maintained at the replacement level.